The Marple Website has now been upgraded! Marple Skatepark Project has been completed! The Website now has its own (share in a) Community Pub! These are just a few of the fantastic headlines looking back on the Marple Website's year. I first mentioned upgrading the web site to a modern mobile-friendly format in the 2014 Christmas Greeting and actually started work on it even earlier than that. It has been slow-going for all sorts of reasons, some software and technical issues, but mostly it was delayed due to distractions like trying to get a skatepark funded and built. So I've only managed to work on it infrequenty until a big push in the last half of this year got it far enough along that I felt comfortable launching it on the public. It's still rather over-whelming to look at the old site and see how much "stuff" there is to sort through, upgrade and transfer across while continuing to look at new ideas and new features too. One of these latest new features is a special page set-up to help people understand what Marple Area Committee is all about and to try and help them improve engagement with the local community. I was really pleased to be invited to join a small team of local volunteers to review with councillors how this might be achieved. There were lots of great ideas but obviously one of the ways I could help most was by creating something, hopefully simple and easy to understand, that links through to the council's own much more comprehensive but sometimes bewildering web site. 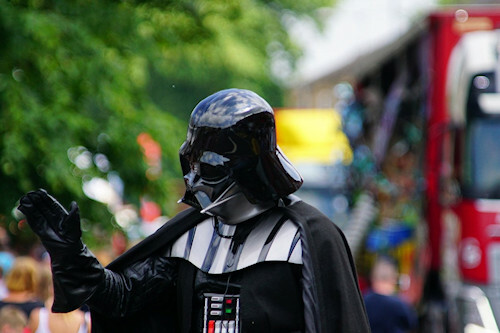 As part of the relaunch I've also taken the opportunity to embrace Facebook and Twitter to try and claw back visitors. When the web site began almost 20 years ago there was no social media and barely any competition at all. Today the Internet is a totally different environment, almost every organisation has its own web site, almost everyone is on social media, and it can be really hard to hold people's attention for more than a few seconds as there are so many on-line distractions. The only answer seems to be to use these platforms too and try to draw people back in. The main objective of the new site is to remain the Community Hub for groups in Marple and maybe help everyone work together. It's off to a great start with over 60 local groups listed in the new searchable Community Directory. If your group or organisation isn't in there, please do get in touch. After working on Marple Skatepark Development Project since 2011 it was hugely gratifying to see it completed and opened in March this year. We held a Skatepark Jam on Easter Monday to celebrate the opening with users and then had an even bigger event at Marple Carnival, when we invited back Team Extreme. They were with us at the 2013 Carnival when we were just getting the project off the ground. Team Extreme put on an amazing display of scooter, BMX, in-line skate and skateboard skills and it was really good to welcome back veteran skateboarder Dave Monaghan, who was with us in 2013, and have two female skateboarding professionals along to show that girls can do it too. We had raised all the money we needed by Christmas last year and that was fully detailed in the 2016 Christmas Greeting but to summarise, we raised over £50,000 within the community that was matched with £50,000 by Stockport Council from Formal Sports Commuted Sums. 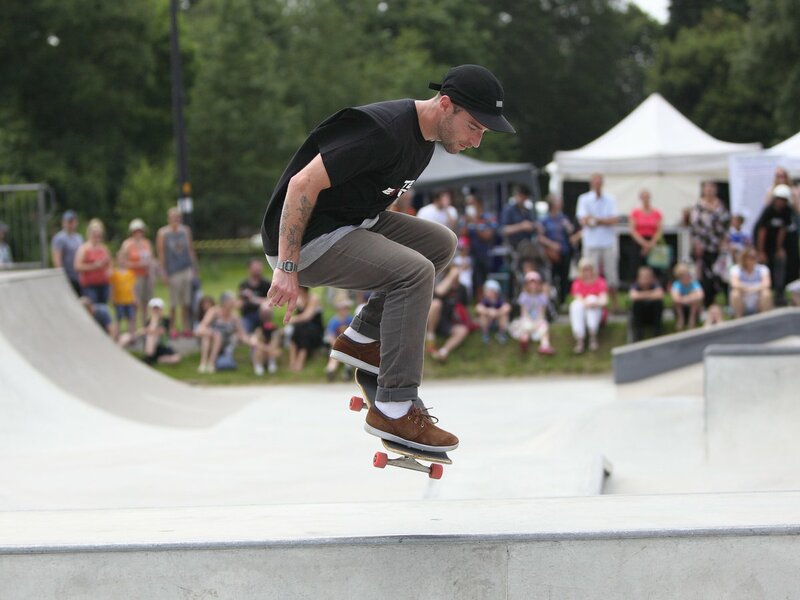 One boost that we did have this year was an extra £11,750 awarded by Life Leisure to enable us to concrete the lower section of the existing skatepark at the same time as the new park was built. This was a huge help as that section would otherwise have worn out really quickly with all the extra use. Great help was received this year from local businesses Marple Blasting Services, who helped us to refurbish the old benches recovered from the teen area and also GT Landscapes and Construction, who reinstalled them for us alongside the new skatepark. My thanks go to these and to all the people who helped us achieve this fantastic outcome. I'd also like to say a special thanks to Lewis Abbott and Jay Saenz, who have been with the project all the way through and been key to its success. Although the orginal project objectives were completed this year, we have developed new plans for the top section of the skatepark and the basketball court too. The hope is that we can improve the flat skating area at the top of the park and also resurface the basketball court and turn it into a MUGA (Multi-User GAmes) facility. This will really finish the teen area off and secure its future for many years to come. A planning application was submitted on 14 December 2017 and we now await the planning process to run its course. If approved around another £75,000 will be needed to build it. Thanks are again due to Marple Blasting Services, who blast-cleaned the stone and GT Landscapes and Construction who installed it for us. You can read more about the project to install it on the Friends web site and more about the history side of things on the History Society's site. The World War I Timeline in Marple Memorial Park continues to grow in "real time" 100 years on from Marple's incredible losses, which of course were felt in a similar way all over the country in every city, town and village. With 46 men on the memorial who were killed in 1917, Marple's casualties displayed on the timeline since 2014 now number 91. In November 2018 the country will commemorate 100 years since the end of the Great War. Throughout the year the timeline will continue to grow, with another 46 men falling in 1918 and 4 more in 1919 to bring the total to 141. The timeline began as a temporary display but the reaction to it has been so positive that Friends of the Park feel it will be a great shame to remove this information from the park. Therefore next year we plan to look at a project to turn it into a more permanent display. As well as the display in the park, the Timeline can be followed on the Friends of the Park web site, the Community Forum and on social media too, with dedicated Facebook and Twitter accounts. For the last 11 years now the Marple Website has managed to support local projects and causes with donations averaging around £1,000 per year. In 2017 the biggest contribution was an investment of £1,000 in the Northumberland Arms Community Pub. Other donations this year include £40 to Mellor Archaeological Trust and £40 to Friends of Our Valley (to celebrate the 80th birthday of Ann Hearle), £182 to Friends of Marple Memorial Park, £20 sponsorship of the Marple Street Poppies and £50 towards the Marple Town Centre Defibrillator. It was also rewarding to be able to help the Poppy Appeal in Marple get back on track and assist local Defibrillator champion Phil Cooke and Marple Civic Society raise the balance of money needed for the Town Centre Defibrillator Project. This takes the running total of community investment by The Marple Website to £11,382 since 2006. That's an average of over £1,000 a year for the last 11 years! Since 2010, thanks to the excellent support of the Marple Website's Local Business Sponsors, community donations have been made from the income generated by advertising banners. A banner advert is a great way to promote your business and support your local community web site at the same time. There's also a sponsors' area of the forum that advertisers can use if they wish. The banners are primarily aimed at local Stockport based organisations and businesses, so if you're interested in promoting your local business on the site have a look here, and get in touch. The History Society and the Marple Website have worked together on this project for over 2 years, setting up the platform, working out processes and procedures, and getting the initial data uploaded. Over 3.5 Million image views on the Marple Website Virtual Tour! And as I write, the counter on the Virtual History Tour has reached 3,513,965 image views and there are exactly 12,000 local images shared, many of them from the society's archives. Due to the push to complete the skatepark, working with Marple Local History Society to create and launch their on-line archives and then turning my attention to the upgrade of The Marple Website, in 2017 the Virtual Tour has not received the level of attention that I would have liked to give it. Despite that, over 600 photos have been added during the last 12 months. The total number of images on the Virtual Tour has now reached exactly 12,000 and they've been viewed an amazing 326,842 times since Christmas 2016. There are still plenty of images from Marple Local History Society's Archives to scan and a significant number of postcard images provided by collector Janet Holmes still to upload. So the Virtual Tour is set to continue growing throughout 2018. 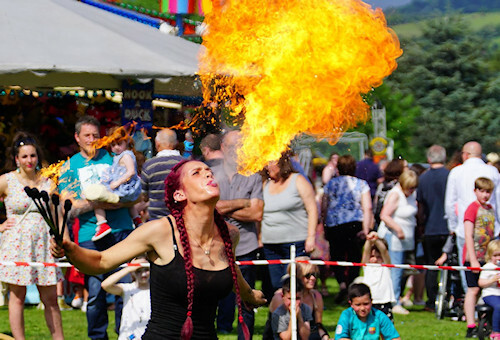 Local photographer Arthur Procter continued his wonderful support of the site in 2017 and has shared his photos of local events in and around Marple. His great contributions this year include: Hawk Green Maypole Event, Marple Carnival 2017, Marple Community Cafe Opening, Events at Marple Lime Kilns, Mellor Mill Fact and Fun Day, Marple Food and Drink Festival, the Remembrance Service in Memorial Park and Marple 2017 Christmas Events. For the last few years we've had some great Marple Carnival photos from Jake Taylor too, and 2017 was no exception. Above are just two from Jake's contribution this year. Jake has also kindly given permission for his photos to be used to illustrate the pages of the new Marple Website. This has begun already with the revamp of the Virtual Tour of Marple Locks. Thank you to the people who keep coming back! I've said every year for as long as I can remember, the Marple Website thrives on its visitors coming back again and again and it's all about the local community making contributions and keeping the site fresh, active and alive with new information. I'm hoping that by relaunching on a mobile-friendly platform this year, by embracing Facebook and Twitter to grab the attention of visitors and focussing on providing as much Marple related information as possible all in one place, the site can hold its own against the increasing dominance of global social media platforms, in particular Facebook, which is swamped with Pages and Groups covering every subject possible. Use of the forum continues to decline and the posting figures are down to around 25% of the heydays of 2010/11, when it was pretty much the only place to discuss Marple matters on-line. Once again, this is due to the growing dominance of Facebook and maybe it's inevitable that these kind of forum platforms will become a thing of the past, a bit like when the railways came along and the canals fell into decline. At the moment I think it still has something to offer, particularly as a Community Calendar with everything that's going on in Marple all in one place but with links outward for more information. We'll see what 2018 brings but use it or lose it remains the mantra. Thanks as ever to Howard for help to moderate the Forum, a much less demanding task than it used to be, and to Arthur Procter for his wonderful photographs. Thanks also to everyone who continues to support the site by coming back to see what's new - that's the most important thing of all!